Tongue Anatomy is a photograph by Science Photo Library which was uploaded on July 24th, 2016. 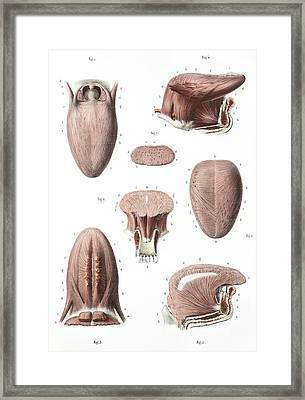 Tongue anatomy. 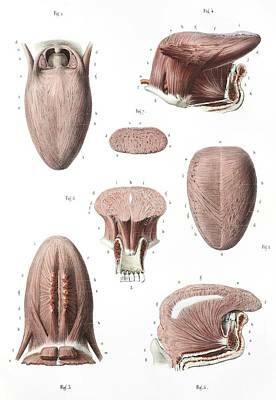 19th century artwork showing the musculature of the tongue. Top left and centre right show the muscle fibres on the dorsal (top) side of the tongue. Bottom left shows the muscle fibres on the ventral (bottom) side. Upper centre and centre show transverse sections through the tongue and tongue and lower jaw (centre). At centre the inner muscle between the tongue and jaw is the styloglossus, the outer muscle is the genioglossus. Top and bottom right show profile sections through the lower jaw. 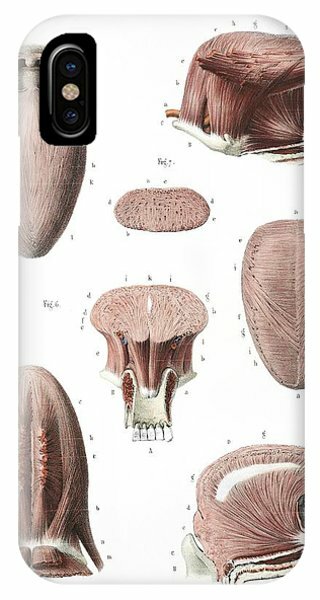 The main expanse of muscle at bottom right is the genioglossus. At top right this is overlaid with the hypoglossus (left) and styloglossus (top). This anatomical artwork is plate 15 from volume 5 (1839) of 'Traite complet de l'anatomie de l'homme' (1831-1854). This 8-volume anatomy atlas was produced by the French physician and anatomist Jean-Baptiste Marc Bourgery (1797-1849). The illustrations were by Nicolas-Henri Jacob (1781-1871). 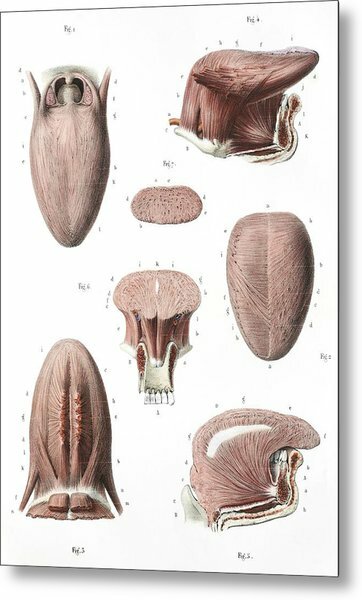 There are no comments for Tongue Anatomy. Click here to post the first comment.